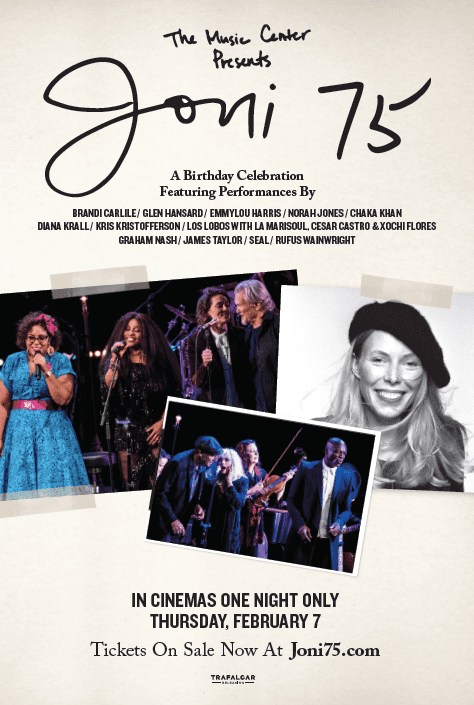 11 January 2019 (Toronto, ON) - Honouring one of the world’s most revered artists, Joni Mitchell, on her 75th birthday, The Music Center Presents Joni 75: A Birthday Celebration brings an incredible array of singers and musicians to cinemas across the U.S. and Canada for a one-night-only celebration on February 7, 2019 in collaboration with global event cinema distributor Trafalgar Releasing and The Music Center, Los Angeles’s premiere performing arts centre. Captured live at the Dorothy Chandler Pavilion, this special event features Brandi Carlile; Glen Hansard; Emmylou Harris; Norah Jones; Chaka Khan; Diana Krall; Kris Kristofferson; Los Lobos with La Marisoul, Cesar Castro & Xochi Flores; Graham Nash; James Taylor; Seal; and Rufus Wainwright, who perform many of Mitchell’s songs including “A Case of You”, “Both Sides, Now”, “Down To You”, “For The Roses”, “The Boho Dance”, and “Two Grey Rooms” among others. Co-musical directors, providing the musical arrangements for the show, are percussionist Brian Blade, who recorded three studio albums and toured extensively with Mitchell, and, pianist, composer, arranger producer Jon Cowherd. 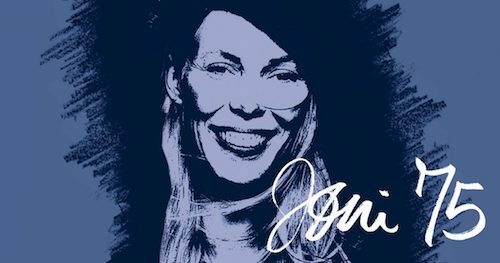 Tickets for The Music Center Presents Joni 75: A Birthday Celebration will be on sale beginning today at joni75.com or at participating theatre box offices. The film will be shown in twenty Canadian Cineplex theatres on February 7. Watch the trailer HERE. The Joni 75: A Birthday Celebration CD is available for pre-order now HERE. A music icon whose work continues to inspire generations of artists, Mitchell performed on the Dorothy Chandler Pavilion stage in 1972 and 1974, with the Los Angeles Times describing her 1972 concert as "Joni Mitchell in a Giant Living Room".